equals() and hashCode() in Java are two fundamental method which is declared in Object class and part or core Java library. If you have any one of below concerns in Java then you are at right place. Let’s take a look at simple example to understand first Reference Equality and Logical Equality. The equality operator (==) compares the references (addresses in memory) of the two Strings as two different numbers – this is known as Reference equality. Logical equality compares the data of the objects instead of the value of the references. // so that both references point to the same String object in memory. 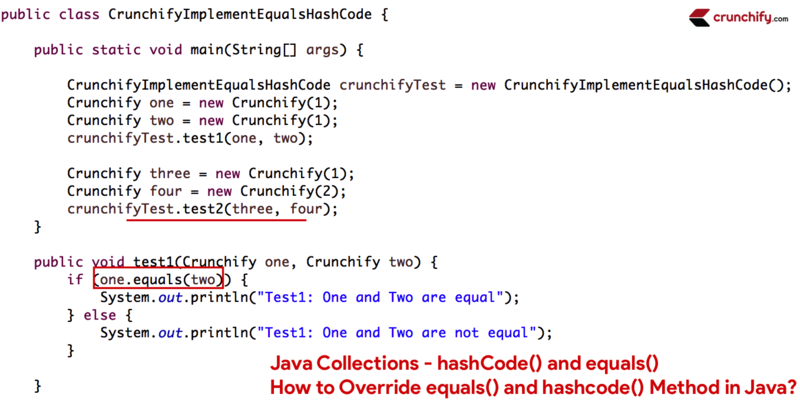 if you override equals, you must override hashCode. hashCode must generate equal values for equal objects. equals and hashCode must depend on the same set of significant fields. You must use the same set of fields in both of these methods. You are not required to use all fields. For example, a calculated field that depends on others should very likely be omitted from equals and hashCode. It is a popular misconception that hashCode provides a unique identifier for an object. It does not. * How to Override equals() method in Java? * How to Override hasCode() method in Java? // The method does override or implement a method declared in a supertype.